- The most popular recommended bottles today were: the Nook, Como Tomo, and Dr. Browns. - Num Num Gootensil - a first spoon. - EZPZ Placemat - this is the suction-y placemat I showed in class. And here is the bowl version. - The Zoli cup is a great first cup for learning how to use a straw. The WOW cup and Munchkin 360 were the cups we talked about that don't have any straw/spout. If your child is having a hard time learning how to use a straw, check out this Bear Therapeutic Straw Cup. - Here are the disposable placemats we talked about today that can be used in a restaurant. - Bambas are the peanut puff we talked about in class today! Developmental Play Tip: Going out and about is often great for fussy babies because the activity and noise can serve as white noise and help to calm them! But, if you’re having a hard time getting out of the house, don’t feel guilty! You can create fun experiences at home too! My favorite thing to do with a little baby during the summer at home is to create different sensory experiences for them. It’s good for their brain and easy! I love to fill a bowl with water and let baby play and splash in it (while you’re holding them and watching closely!) I also love letting babies play in the dirt or lay in the grass under some shade. Today we heard from Chelsea, Yumi's nutritionist, and also had a tasting of their baby food. The notes that I took from our discussion with her are below. I've also included notes of things that came up during questions in all of our classes on feeding! You can start solids with your baby around 6 months old after you've gotten clearance from your pediatrician! Your baby should be sitting, have good control of their head, and be interested in food! Sugar - When you purchase baby food, keep an eye out for the amount of fructose in the baby food you buy. Look at the ingredients listed - the first ingredient listed is the ingredient that is used most. For example, in a spinach/sweet potato puree, apples shouldn't be the first ingredient. Good to have a mix of fruits and veggies because they’re digested differently. Veggies are digested very slowly and would be hard on your system if you ate only veggies. Fruits move through your body more quickly. Constipation - try Spinach to get things going ;) Also make sure baby is drinking water with meals. Iron - an important nutrient with babies older than 6 months. A little caveat about the chart above and solids.... I've read a number of resources (including Super Baby Foods) that suggest using 1-2 Tablespoons per year of age as a general rule for serving size. So... if you are serving your 1 year old vegetables, 1-2 Tablespoons would be an appropriate serving size. This varies slightly from the charts above, but is easier for me to follow. 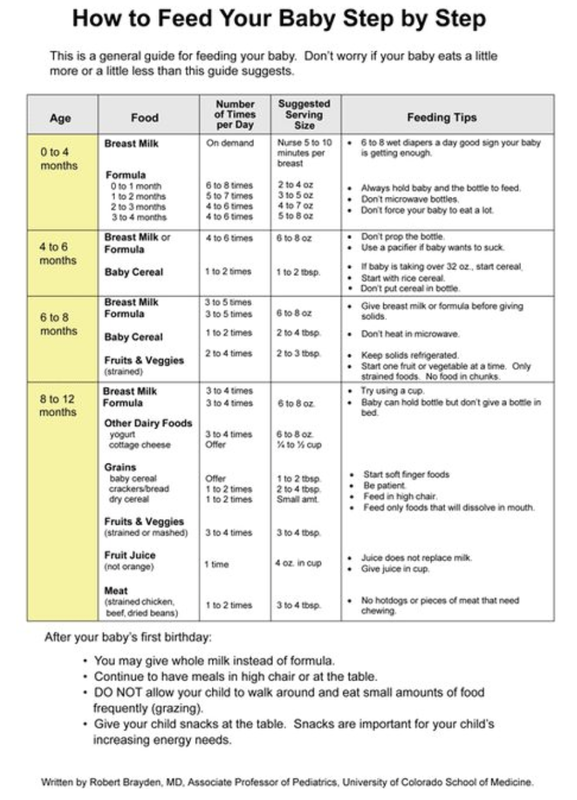 :) Also - keep in mind that major organizations now recommend starting solids at 6 months. Introduce solids after 6 months, when baby shows signs of readiness (unless otherwise directed by pediatrician). The following organizations recommend that babies be fed only milk the first 6 months of life: World Health Organization, American Academy of Pediatrics, American Academy of Family Physicians, UNICEF. HOW do you start solids? Regardless of “how” you decide to feed your baby, here are a few of our most important tips! If you choose to feed your baby purees, make them chunky as soon as your baby will tolerate it! This will help babies become accustomed to texture and ideally lead to less pickiness later on. Try to allow them to feed themselves with a “loaded spoon” as much as possible. This is great for developing motor skills as well as encouraging your baby to follow their own hunger cues. Remember that your baby’s tummy is tiny. A tablespoon (even 1⁄2 tablespoon according to some sources!) can be a full meal for a 6 month old. 3 berries is a full serving of fruit for a toddler! As much as possible, try to feed your baby things that your family typically eats. Whether you feed them directly off of your plate or puree/mush up food from your dinner, this is exposing your baby to the tastes and foods they’ll be eating later in your home! If your baby doesn’t like the taste of a food... try, try again! It often takes between 6-10 times of trying before a baby will accept a food! Let your baby get messy! Not only does this sensory exposure help potentially prevent picky eating later, it also helps their brain grow! Messy feeding experiences are great learning experiences for your little one!! Today we talked about easy first finger foods and ways to cut/serve food to help prevent choking. Remember to avoid honey before a year old (including in cooked foods! ), and to limit salt as much as possible. Here are some pictures of ways that people serve finger foods to very young eaters. :) Refer to the instagram accounts above for even more ideas! Here are the books I talked about today and recommended in class. Some Nest moms have used and love Nancy Nguyen to do in-home CPR. Her number is 562-472-5998.
www.feedinglittles.com - this mom-owned company has a feeding group that I found invaluable with my youngest son – message me on facebook and I’ll add you to the closed group! Their instagram is great for ideas: @feedinglittles. They also have a great website, newsletter, and two great feeding courses - one for babies which gives you all the ins and outs of baby led weaning, and one for toddlers. www.wholesomebabyfood.momtastic.com: This website has the answers to pretty much everything you’re wondering! How much to feed your baby, when, what to do about allergenic foods, great food choices, and more! Includes information on feeding purees as well as baby led weaning (BLW). www.superhealthykids.com - lots of recipes searchable by ingredient, meal, etc. - Think your baby may have allergies? Riviera Village Allergy - Dr. Ziegner - has done skin panels on Nest babies, and many moms have said their experience with her helped them identify allergens! - The Pediatric GI Doc many Nest moms have been to and love is Dr. Abrams.